by Carl D. Schneider, Ph.D.
Apology is a ritual exchange, where what is offered in exchange for the injury done is, in Tavuchis' phrase, "nothing, except a...speech expressing regret." Aaron Lazare has best captured the ritual exchange of apology: "What makes an apology work is the exchange of shame and power between the offender and the offended." Apology is central to mediation: mediation regularly involves disputes in which one party feels injured by the other. An apology is an act that is neither about problem-solving or negotiation. Rather, it is a form of ritual exchange where words are spoken that may enable closure. In the language of transformative mediation, apology represents an opportunity for acknowledgement that may transform relations. Most of us recognize its role in victim-offender mediation and community conferencing, but it can play an equally critical role in other forms of mediation, including employment and divorce mediation. ASSISTING CLIENTS WITH APOLOGY: WHAT MAKES IT WORK? People can authentically apologize in mediation, but they often need help in getting past the defensiveness and fear of blame that preclude apology. Apology can not be imposed. It is a moment of opportunity. Parties often need preparation and help with the words. An apology involves such vulnerability that often the only way it is safe enough is with the mediator's assistance in putting the apology in words. Apology involves an exchange of power and shame. Apology is a form of non-coercive power-balancing enacted by parties in which the powerful offer their vulnerability and through recognition, the injured/humiliated are empowered. Apology can be a critical element in the settlement of lawsuits. Many of us have been in mediations in which there is a palpable desire for - sometimes an explicit insistence on -apology from plaintiffs. Many of us have witnessed the enormous cost of missed opportunities for apology. The pairing of the law and the adversarial system, however, makes for a matrix antithetical to apology. The preoccupation of American jurisprudence with defending individual rights and fears of admitting culpability can function to preclude apology with its naked unqualified acknowledgement of responsibility. As Lon Fuller has noted, adjudication involves rational ordering of a complaint according to principle whereas apology is not an appeal to reason. The adversary system breeds defensiveness; apology requires vulnerability. It is possible to have a legal system more supportive of apology. The legal system in Japan functions quite differently and there apology plays a major role as a social restorative mechanism. When attorneys are present in mediation it is generally far more difficult to hold open the space for apology, since attorneys are habituated to their role as "watchdog, guarding against their client's unwitting forfeiture of legal entitlements" (McEwan). This creates a wariness of apology which is a moment where a client relinquishes all justifications, excuses, and counter-claims and instead faces the other with moral transparency. Apology and the adversarial system resemble David encountering Goliath: the one is loaded down with protective armor, the other comes seemingly defenseless. Many mediations are centrally about a damaged relationship. Trust has been broken. When offered with integrity and timing, an apology can be a critically important moment in mediation. An apology, when acknowledged, can restore trust. As Wagatsuma observes, "There are injuries that can only be repaired by an apology." The past is not erased, but the present is changed. In divorce mediation an opportunity sometimes occurs for clients to acknowledge they have acted in ways that have created injury and they are sorry for the damage inflicted on their marriage and their spouse. 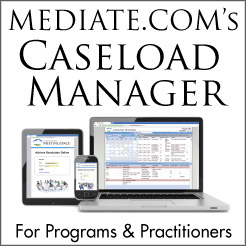 The mediator can help people face damaged bonds and sort through what remains. With the marriage vow broken and trust betrayed, does anything remain? Is everything destroyed? An apology is an opportunity to say, "Yes, there has been a terrible wound here, for which I am truly sorry. My intention is not to destroy you. I am ending a marriage, but I would like to close that door gently, not slam it shut." Lazare, A. "Go Ahead, Say You're Sorry." Psychology Today, January/February 1995, 40-43, 76-78. Levi, D. "The Role of Apology in Mediation." New York University Law Review. 72, (5), November 1997. 1165-1210. Moore, D. B. "Shame, Forgiveness, and Juvenile Justice." Criminal Justice Ethics, Winter/Spring 1993. Scheff, T. J., Bloody Revenge: Emotions, Nationalism, and War. Boulder: Westview Press, 1994. Tavuchis, N. Mea Culpa: A Sociology of Apology and Reconciliation. Stanford, California: Stanford University Press, 1991. Wagatsuma, H. and Rosett, A. "The Implications of Apology: Law and Culture in Japan and the United States." Law & Society Review, 1986, 20 (4), 461-498.